The Benny Goodman Story (1956). Biographical film. Cast: Steve Allen and Donna Reed, Director: Valentine Davies. This film is based on the life of clarinetist Benny Goodman, who recorded most of the clarinet solos used in the film. Lionel Hampton, Martha Tilton, Kid Ory, George Givot, Gene Krupa, and many other musicians have cameo appearances in this film. However, while Ziggy Elman performed on screen recreating his trumpet solo on "And the Angels Sing", he was unable to record his portion for the soundtrack; Manny Klein actually performed it, off-camera. I just love biographical films. This story begins with Benny becoming an excellent clarinetist by the time he is fourteen. Benny grabs the first opportunity to play in a ragtime band, joins the musicians' union, and begins his career. He has the opportunity to listen to the "Kid", who tells him to play the way he feels and invites him to sit in. Benny joins the Ben Pollack band and plays at dances throughout the country. The Pollack band secures a job in the speakeasy of Benny's former neighbor, now gangster, Little Jake Primo. There he meets John Hammond, a music critic and his sister Alice, who prefers classical music. Pollack's band flops in New York. Benny begins to worry that there is no audience for his kind of music and is forced to perform with more traditional dance bands. Still impressed with Benny's talent, Hammond invites him to perform a Mozart clarinet concerto before an audience in the Hammond mansion. Alice is surprised by "all this emotion comes pouring out" when he plays. Benny forms a band and begins to play on an NBC Saturday night radio program. Jazz musician Fletcher Henderson hears the program and is so impressed that he contributes arrangements for the band. After the show is canceled, Benny's orchestra goes on tour, but before he leaves, he and Alice declare their feelings for each other. The tour is a failure until the orchestra reaches Palomar, California, where the group is a huge success. Benny sees Alice in the audience and plays "Memories of You" for her. Benny forms a quartet that includes Lionel Hampton, Teddy Wilson and Gene Krupa, and by the time Benny, his orchestra, and his quartet return to Chicago, they are making headlines. Benny is booked into Carnegie Hall and worries that "a hall full of longhairs" will not like the orchestra's music, which features guest performers Harry James, Ziggy Elman and Martha Tilton. 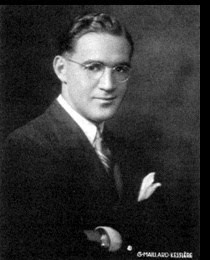 Benny Goodman's band performed in many musicals: The Big Broadcast of 1937, Hollywood Hotel (1938), Syncopation (1942), The Powers Girl (1942), Stage Door Canteen (1943), The Gang's All Here (1943), Sweet and Lowdown (1944) and A Song Is Born (1948). Goodman's only starring feature was Sweet and Low Down (1944). 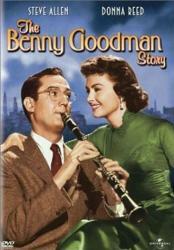 Goodman's success story was told in the 1955 motion picture The Benny Goodman Story with Steve Allen and Donna Reed. It was a follow up to 1954's successful The Glenn Miller Story. The screenplay was heavily fictionalized, but the music was real. Many of Goodman's professional colleagues appear in the film, including Ben Pollack, Gene Krupa, Lionel Hampton and Harry James. This clip features Benny Goodman'a band playing "Sing Sing Sing", featuring Gene Krupa at the end. Also... Mr. Harry James plays a trumpet solo. Dawn, this is a great pick! I enjoy musical biographical films, too. In fact, if I had seen THE BENNY GOODMAN STORY before THE GLENN MILLER STORY, I might have played a woodwind instrument in school band. Drummer Gene Krupa, who plays himself here, also got the musical bio treatment three years later in THE GENE KRUPA STORY starring Sal Mineo. Dawn, I love bio films, too. Actually, my view of history was quite skewed as a kid because I believed all of the stories of famous people and events made into movies in the old days! Well, who cares, they're fun! I didn't know that Elman's trumpet solo had to be done by someone else. That's a shame. Good write-up, Dawn! Sing, Sing, Sing has to be one of the top five performances for that era, or any other era for that matter, in my opinion. Dawn, I've never seen this film, but you make it sound very entertaining. Thanks for the nice review. Great job, Dawn! I enjoyed watching the clip you attached, too. I remember "The Glenn Miller Story" the best of the biographical movies. Do you play an instrument, too? Terrific write-up, Dawn! A great selection for a musical month. I'm a fan of movies about musicians, especially jazz, and I also like Donna Reed (and her show). Rick, I have not seen, THE GENE KRUPA STORY. I will have to check it out. Bec, I agree, Bio films are fun! As a kid I really do not think we see the world as it really is. Kim, Thank you. I was disappointed to learn that the Benny Goodman story, was not part of the Donna Reed tribute. Anywho...I hope you get to see the Beeny Goodman Story soon. Toto, Thank you. No, I do not play an instrument. If I did. it would be: Spanish guitar. Which, I feel is very romantic music..
Sark, Thank you. Fun to know that you are also a Jazz fan. I just posted a Harry James tribute, over on, Noir and Chick Flicks: Musical page, if you want to run over and take a look. Arnold, Thank you for dropping by. I will check out your website. Dawn, you do need to check out The Gene Krupa story, as a drummer, I can say Sal does a good job, the film also has James Darren as his trumpet playing best friend. Nice to see you here, Montana. Please keep the comments coming! Funny Face..."let's give 'em the old pizzazz!" Trivia Time Part 36 - The Answer to # 7.